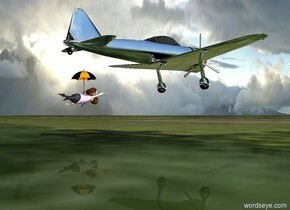 a silver a-6m zero airplane is 50 inch above the ground.a man is 35 inch above the ground.an umbrella is -10 inch above the man.ground is grass. a [metal] grenade is -0.4 feet to the left of and -0.2 feet above the horseshoe. it leans 32 degrees to the southeast. the horseshoe is on the ground. a [fire] star is -1.8 feet behind and -2.1 feet above the grenade. the horseshoe of the horseshoe is [texture]. the sun's azimuth is 200 degrees. the sun's altitude is 83 degrees.the ground is grass. 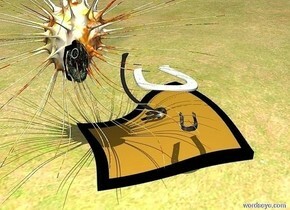 a horseshoe is 0.3 feet right of and 0.2 feet below and 0.4 feet to the front of the grenade. it leans to the southwest. the sun's altitude is 78 degrees. the sun's azimuth is 200 degrees. Just my luck , The last bus ! a 8 feet tall bus stop.a bus is 2 feet in front of the bus stop.the bus is facing right.the bus is 2 feet right of the bus stop.a lamp post is 6 inches right of the bus stop.a man is left of the bus stop.the man is 1 feet in front of the bus stop.the man is facing the bus.two yellow lights are 1 feet above the lamp post.it is night.a white light is right of the bus.a white light is in front of the lamp post.two blue lights are above the bus.a red light is behind the man.four cyan lights are 2 feet above the bus stop. 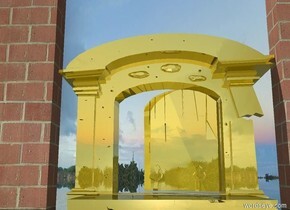 a gold door.the door is 40 inch tall and 50 inch wide.left of the door is a brick wall.right of the door is a brick wall.ground is clear. a giant penny. 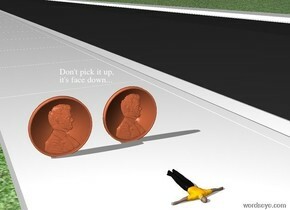 the penny is 2.2 inches off the ground. another giant penny is 1 inch right of the penny. the ground is grass. a 1000 foot long road is -1 foot east of the penny. the road is on the ground. a 4 inch tall man is .51 foot in front of the penny. the man is leaning 90 degrees to the south. the man is 2 inches off the ground. 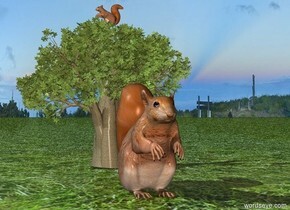 a 10 inch tall squirrel.ground is grass.behind the squirrel is a 20 inch tall baobab tree.a 2nd 3 inch tall squirrel is -1 inch above the baobab tree.the 2nd squirrel is facing west.sun is forget me not blue. a 4 feet tall wood barrel. it leans 14 degrees to the northeast.a clown is -3.5 feet above the barrel. he leans 14 degrees to the northeast. 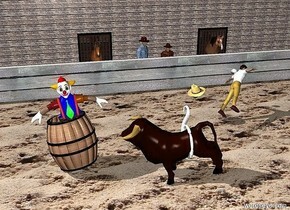 a bull is -0.7 feet to the right of and -1.7 feet to the front of the clown. it faces the barrel. it is -0.7 feet above the ground. it leans 17 feet to the front. a large delta is -3.5 feet to the right of and -4.3 feet above and -4.2 feet to the front of the bull. it faces right. a man is 2 feet behind and 3 feet to the right of the bull. he faces right. he leans 49 degrees to the southwest. he is -0.3 feet above the ground. 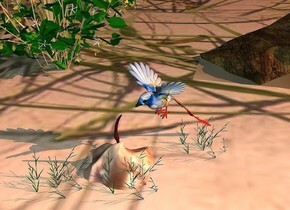 the foot of the man is brown. the ground is unreflective [sand]. the [sand] is 10 feet tall. 1st 4.5 feet tall and 75 feet long [wood] wall is 7 feet behind the man. 2nd 15 feet tall and 75 feet long [texture] wall is 6 feet behind the 1st wall. a hat is 1 feet left of the man and 3 feet above the ground. it leans right. 1st cowboy is 0.8 feet behind and -35 feet to the left of the 1st wall. 2nd 7 feet tall cowboy is 1 feet left of the 1st cowboy. he faces southeast. the shirt of the 2nd cowboy is denim. 1st window is 0.1 feet to the front of and -13 feet above and -27 feet to the left of the 2nd wall. 1st horse is -4 feet to the front of the window. it is on the ground. 2nd window is 13 feet to the right of the 1st window. 2nd horse is -4.5 feet to the front of the 2nd window. it is on the ground. the professor. a 1.1 feet tall hat is -0.7 feet above and -2.5 feet to the left of and -2.1 feet to the front of the professor. it leans 10 degrees to the front. a silver gun is -0.7 feet to the right of and -2.6 feet above and -1.1 feet to the front of the professor. it faces right. the shirt of the professor is [pattern]. the necktie of the professor is [pattern]. a man is 1 feet to the right of the professor. the shirt of the man is [texture]. the hat of the man is [texture].he faces the professor. 1st 0.5 feet tall gold bullet is 0.2 feet right of the professor.it leans 90 degrees to the northwest. 2nd 0.5 feet tall gold bullet is 0.7 feet behind the 1st bullet. it leans 90 degrees to the left. 3rd 0.5 feet tall gold bullet is 0.4 feet left of the 2nd bullet. it leans 90 degrees to the front. 4th 0.5 feet tall gold bullet is 0.9 feet behind the 3rd bullet. it leans 90 degrees to the right. 5th 0.5 feet tall gold bullet is 0.6 feet behind the professor. it leans 90 degrees to the northeast. 1st huge wood crate is 3 feet behind and -1.9 feet right of the professor. the ground is metal. 2nd large wood crate is 4 feet behind and -1 feet to the left of the professor. it faces southeast. the sky is [warehouse]. The camera light is gray. it is noon. the sun is sky blue. 2 dim orange lights are 1 inch above the gun. The man is on the ground. The building is 5 feet behind him. The man is facing the building. The yellow paper is 1 inch below the man's hand. 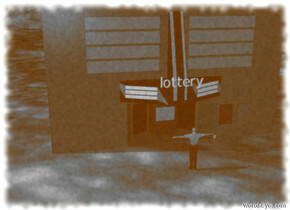 lottery is 1 inch in front of the building. lottery is 10 feet above the ground . The yellow paper is 5 feet in front of the building. The yellow paper is 4 feet above the ground.The yellow paper is 2 inches to the right of the man. The ground is [road]. oh yay, it's my lucky day! 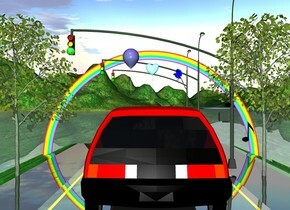 a man.a large clover is 1 foot in front of the man.the clover is leaning 10 degrees to the north.a white light is above the clover. the white clear ground. 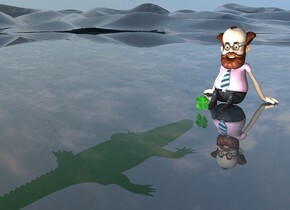 the solid green crocodile is 1 foot in front of the clover. it is 2.2 feet in the ground. it is facing back. the red "LUCK" is on the train track. the train track is 200 feet long. 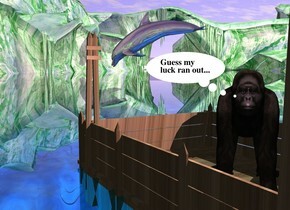 "Preparation" is to the left of "LUCK". "Opportunity" is to the right of the "LUCK". 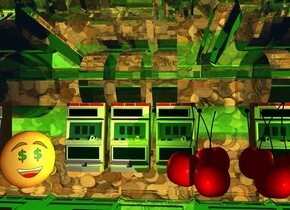 the huge gold sun symbol is behind "LUCK". it is 8 feet in the train track. the first small train is 10 feet behind the "LUCK". the ground is shiny grass. the man is 6 feet above the "Opportunity". he is facing right. the woman is -3 feet above the man. she is facing right. she is leaning 60 degrees to the front. she is -7 feet to the right of the man. A 0.1 inch high sidewalk is -3 feet left of and -0.1 inch above an unreflective texture road. A 20 feet long flat lemon stick is -40 inches left of and -1.4 inches above the sidewalk. It is facing east. It is leaning 90 degrees to the front. A 20 feet long flat lemon stick is 1.5 inches left of the stick. It is leaning 90 degrees to the front. A cigar is -42 inches left of the road. It is facing southeast. A scarlet light is 1 inch in the cigar. A 100 feet high building is left of the sidewalk. It is 1 feet wide brick. It is night. A blue light is 3 feet north of the cigar. Camera light is grey. A small dark brown circle is -34 inches left of and -0.1 inches above the road. A large mole is 1 feet in the circle. It is leaning 60 degrees to the back. It is -15 inches south of the circle. A dark green door is -3 inches left of the road. It is facing east. A can is 12 inches South of and -4 inches west of the circle. A dim light is 3 inches right of the cigar. A tiger is 14 inches north of and -24 inches right of the mole. It is facing the mole. It is -6 inches above the ground. 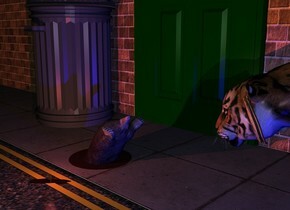 The mole is facing the tiger. The "K" is in the woman. The "C" is 3 inches above the "K". The "U" is 3 inches above the "C". The "L" is 3 inches above the "U". It is dusk. The sun is mauve. The first flat sphere is 4 feet to the left of the woman. It is 4 feet above the ground. A second flat sphere is 1 feet above the first sphere. A third flat sphere is 1 feet above the second sphere. A fourth flat sphere is 1.5 foot to the right of the first sphere. The fifth flat sphere is 1 foot above the fourth sphere. The sixth flat sphere is 1 foot above the fifth sphere. the seventh flat sphere is 7 inches to the right of the woman. it is 4 feet above the ground. the eighth flat sphere is 1.5 feet to the right of the seventh sphere. the ninth flat sphere is 1 foot above the seventh sphere. it is 3 inches to the right of the seventh sphere. the eleventh flat sphere is -2.7 feet above the woman. it is -7 inches to the left of the woman. it is -9 inches in front of the woman. it is facing right. the [Las Vegas] texture is on the sky. it is 1500 feet tall. the ground is shiny. the tenth flat sphere is 2.5 feet above the eighth sphere. a transparent man. the man's swimsuit is transparent. a skeleton is -1.5 foot south of the man. the man is 1 foot off the ground. a huge lightning bolt is -3 feet above the man. an unreflective flat [black] north star is under the man. the north star is leaning 90 degrees to the north. the north star is on the ground. the north star is 15 feet long. a lightning is -3 foot left of the man. the lightning is 3 feet off the ground. the lightning is leaning 90 degrees to the east. another lightning is -3 foot right of the man. the lightning is 3 feet off the ground. the lightning is leaning 90 degrees to the west. another lightning is -3 foot right of the man. the lightning is 1 feet off the ground. the lightning is leaning 90 degrees to the west. another lightning is -3 foot left of the man. the lightning is 1 feet off the ground. the lightning is leaning 90 degrees to the east. another lightning is -1 foot left of the man. the lightning is 4.5 feet off the ground. the lightning is leaning 90 degrees to the east. another lightning is -1 foot right of the man. the lightning is 4.5 feet off the ground. the lightning is leaning 90 degrees to the west. WOW !! a four leaf clover , that's lucky ! 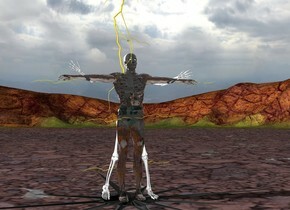 a man.a large clover is 7 inches in front of the man.the clover is leaning 10 degrees to the north.a bomb is 6 inches above the man.the bomb is -12 inches behind the man.a axe is 1 feet behind the man.the axe is 2 feet above the ground.the axe is leaning 30 degrees to the south.a huge black spider is behind the man.a first arrow is 2 inches beneath the axe.a second arrow is 1 inches above the axe.the second arrow is leaning 20 degrees to the south.a knife is 5 inches behind the axe.the knife is face down.the knife is facing the man.a snake is 4 inches left of the spider.the snake is facing southeast.the ground is grass.a white light is above the clover.